Google's latest quarterly financial report shows problems in its AdSense network, which was responsible for 29% of last year's $43.7 billion in revenues. It means a lot less money for Google's network of publishing partners, such as the New York Times. 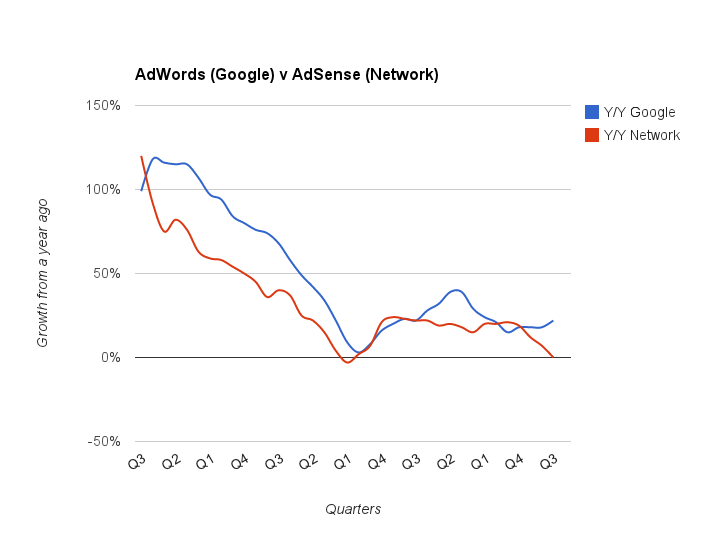 Foremski's Take: $GOOG's Q3 report showed zero growth for AdSense compared with 22% yearly growth for its AdWords network. 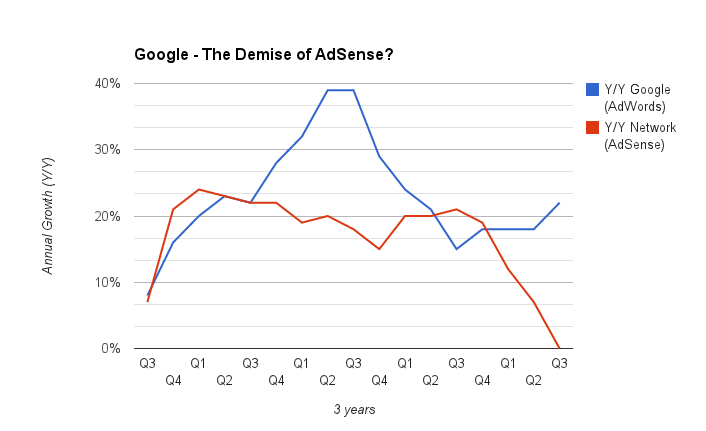 Not only has yearly growth come to a stop but AdSense revenues have shrunk every quarter this year (see chart below). The continuing plunge in AdSense is in sharp contrast to robust 20% revenue growth in 2012, which outpaced AdWords' growth of 19%. This large gap in the performance of Google's ad networks is unprecedented. Historically, they have mirrored each other's growth (below) until about two years ago when Google introduced Panda, its first big change in its indexing algorithm. In Google's Q3 conference call with analysts, CFO Patrick Pichette said, "advertising policy changes" were to blame for the change in AdSense performance. With three quarters of sequential decline in revenues the future of the ad network is uncertain — especially since it shares about 80% of the revenues with its network but keeps 100% of AdWords revenues. The AdSense network has large, legitimate publishers but it also has smaller sites filled with spam, or content stolen from other sites. Google has been criticized for aiding such content theft by allowing pirates to profit from their actions through AdSense, and then sending them traffic through search — effectively making Google an accessory. The AdSense network has been very important to Google in the past and helped it successfully IPO in 2004 at a time when the stock market was skittish about investing in tech companies with volatile revenues. AdSense publishers doubled Google's advertising revenues and stellar growth of 194% — compared with just 88% for AdWords — helped the IPO tremendously, showing potential investors that business was strong and very hockey-stick in direction. Google's IPO was one of the most successful in history and it sparked a new interest in tech stocks, which led to a boom in startups. But is AdSense shrinking because of Google's war on spam and pirates? Or, is it reflecting deeper issues with online advertising that could become serious problems with Google's advertising business? AdWords grew 20% but how much of that is due to "advertising policy changes" imposed early this year that require customers to buy mobile ads even if they cannot monetize that channel? It increases costs for advertisers and their cost of conversions so it could backfire for Google if some accounts that were not performing that well now get pushed into closure. There are serious issues with online advertising affecting the entire industry. Google has reported declining value from clicks on its ads. And the shift to mobile ads is accelerating the decline, because it produces a fraction of the revenue of desktop ads. Matt Sanchez, CEO of San Francisco based ad network Say Media, recently warned that, "Mobile Is Killing Media." Digital publishing is headed off a cliff … There's a five fold gap between mobile revenue and desktop revenue… What makes that gap even starker is how quickly it’s happening… On the industry’s current course, that’s a recipe for disaster. Google has been pushing to diversify. It used to get 98% of its revenues from advertising but in Q3 16% came from other sources, such as enterprise IT, and mobile phone sales. However, those businesses aren't as profitable as advertising. Its smartphone business lost a whopping $1.08 billion in 2012, and losses this year total $645 million. Google's AdSense network is more profitable than its phone business, which is why it will have to somehow resurrect it despite the spam. 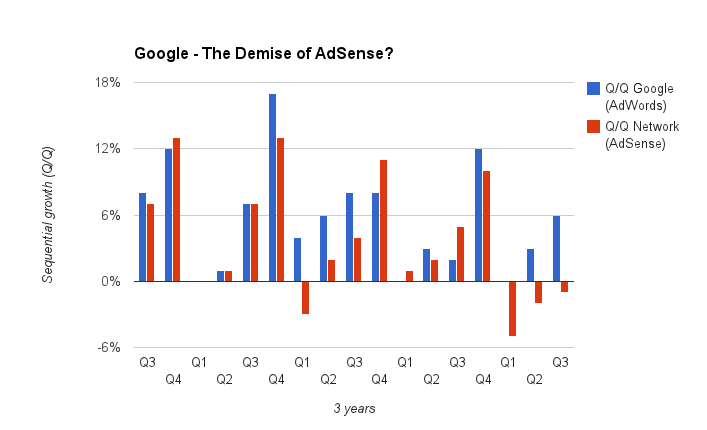 The decline of AdSense says more about Google's ability to fight spam than anything else. It should not be sending traffic to spam and scraper sites in the first place but that's because its algorithm doesn't measure up to its hype. Despite all these challenges the stock market has enthusiastically welcomed Google's Q3 report by boosting shares to new highs. Maybe investors were distracted by self-driving cars and its "moon shots" to pay attention to the negative trends in Google's core business.